All plans are nbn™ ready - when it becomes available we'll automatically switch you. Too easy! All ADSL plans are nbn™ ready. When nbn™ becomes available, we’ll automatically switch you. Too easy! * Typical evening speed indicates average measured download speeds between 7pm and 11pm. Your actual speeds may be different due to various factors. FTTN/FTTB/FTTC/Fixed Wireless speeds to be confirmed once active. Fixed wireless speeds may be slower. See About nbn™ Speeds for more info. Dodo acts as a reseller of nbn™ services. Dodo is responsible for supplying these services to our customers and we have no other affiliation or relationship with our wholesalers outside of our wholesale agreements. When needed, we act as a reseller of Telstra services. We’re responsible for supplying these services to you, our customers, and we have no other affiliation or relationship with our wholesalers outside of our wholesale agreements. Do I Need To Have My Home Phone Service With Dodo To Get A Dodo Broadband Service? You don’t need to have a Dodo home phone service, but you will need an active home phone service. It’ll be easier to get your ADSL internet and home phone from us. Will the technician install my modem and help me setup my internet connection? The technician won’t connect your modem for you, but it’s easy to do on your own. You’ll get a quick start guide with your modem with the instructions. If you need more help, you can call our Tech Support Team on 13 36 36. What’s the average data usage? We'll do all the technical stuff, like setting up an installation appointment and shipping your modem. You'll be all ready to go. And by go, we mean start using the internet to do very important things… like watching Llama videos. Unlimited data & Fetch. The ultimate match. 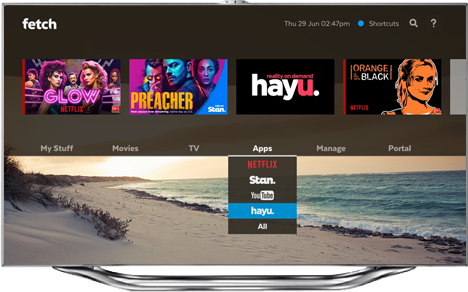 Easily access all the entertainment you’ll ever need in one place, including free-to-air and catch up TV, premium channels, and your favourite streaming subscriptions – all from a single remote control.